A major bolt-testing program in Sydney’s M5 tunnel has been streamlined by the use of portable Enerpac (A Division of Actuant Corp) hydraulic equipment that speeded up and simplified the testing process, minimising the inconvenience to tunnel traffic. The testing – which involved one of the early applications in Australasia of Enerpac’s new BP series heavy duty 28 volt lithium ion battery pumps - was part of a water mains replacement program that followed a truck accident in the tunnel that damaged the pipeline. The hydraulic technology involved is relevant to a wide range of industries using bolts in inaccessible or remote applications, including pipelines, tanks, tunnels, plant and machinery. Each of the threaded studs that were fastened to the M5 tunnel wall to support the pipeline had to be subjected to a test load to verify its structural integrity. A pulling force of 4.75 kN (4.75 tonne) was applied to each bolt in turn and held for 20 minutes. If any of the bolts failed the test, they would have to be replaced and retested. The job was done late at night with the M5 tunnel closed to traffic. About 50 bolts were tested along a tunnel length of about 160 metres with 14 nights scheduled for the testing. Mark Masling of Eagle Rigging approached Enerpac to help him develop a tool that would allow him to apply the proof load to these bolts. “I’d used hydraulic testing gear before for this kind of work, but this time I needed a much bigger ram,” said Mark Masling of Eagle Rigging. Enerpac recommended an RCH-121 hollow core cylinder. “An alternative method might have been to use a block and tackle, but it would have been cumbersome and impracticable. I would have needed a 6 tonne chain block and a small gantry. That’s a lot of cumbersome gear to set up. It would have taken us at least a further hour to test each bolt. The job was performed from a scissor lift aerial platform. Before testing each bolt, a plate was placed over the bolt to disperse the force of the hydraulic cylinder over the tunnel wall. 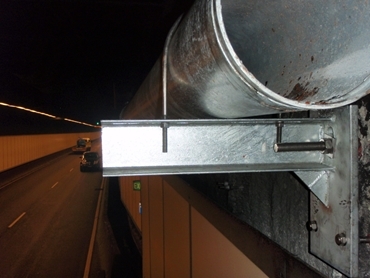 “We set up the Enerpac hollow cylinder with a ¾ inch high tensile rod that fitted inside the cylinder and connected, via an adaptor, to the 24 mm bolt that projected from the tunnel wall. This got around the fact that the tunnel bolt was too wide and not long enough to slide through the cylinder,” Mr Masling said. The task required the equipment to be portable and uncomplicated, as well as providing its own independent power source. The new Enerpac BP124-E electric pump was seen as an ideal choice for powering the cylinder. “The big issue was access, as the work was at a height and in a situation where a power supply was not available, so a lightweight and portable battery-powered pump was a huge help,” said Colin Chapman, National Sales Manager of Enerpac Australia. The BP series heavy duty 28 volt lithium ion battery pumps weigh only 9.6 to 10.9 kg yet can power the latest generations of compact, powerful high pressure single-acting tools and cylinders up to 700 bar (10,000 psi). The Enerpac BP124-E pump was used in conjunction with a V-66 manually-operated load holding valve and a V-152 adjustable relief valve so that the maximum allowable pressure could simply be dialled in. “Enerpac were terrific in assessing my needs and providing equipment. I would certainly use them again in similar situations. I’ve purchased the present equipment and will adapt it to future jobs by changing the head. I can see other uses for it,” he said. The Enerpac RCH-series of single-acting hollow plunger cylinders accommodate both push and pull forces and are supplied in capacities ranging from 125 kN (13 ton) to 931 kN (95 ton). Cylinder stroke ranges from 8-155 mm and collapsed height from 55-323 mm. The BP-series of battery-powered pumps provide speed and power in a portable, cordless format. Their lightweight, compact design includes an integrated handle for easy carrying and positioning. The heavy duty 28 volt lithium-ion battery pack delivers constant fade-free power and a quick one-hour charge. Two 3 amp-hour battery packs and a quick charger are included. Enerpac high-strength hydraulic cylinders, pumps and valves are part of the company’s extensive range of safety-oriented, energy saving and labour-saving technologies, including lifting, pumping, fastening and maintenance tools. The company has a solution for virtually any application in most industrial and commercial work environments. It offers hundreds of different configuration of cylinders and lifting systems, plus products ranging from jacks and lifting bags, for portability and tight fits, to engineered systems for precise control over multiple lift points.